Deep and Engaging Story, Great Characters, and Amazing Animation. Well I've read the manga a while ago, but never did I think it would get an anime adaptation this awesome. Story 10/10: Although it does have a few cliches seen in many shonen, it is otherwise completely original, suspenseful and will have you on the edge of your seat every episode. Assuming the anime follows the manga faithfully, you are all in for many incredible twists!!!! Look forward for it, I can't wait. Characters 10/10: Although only 2 episodes have been released, the character development is incredible. The 3 main characters should and most likely will be fleshed out wonderfully in the anime (if going by the manga), their back-stories are quite good/surprising/original. Animation 10/10: What more is there to say? Overall: This anime will most likely be the best of the season, it certainly had the best first episode of any anime I've watched, and there's no doubt production values will be on the high side. Here's hoping for another season after the first 25 episodes! Enjoy watching, it won't disappoint. Shingeki No Kyojin, highly acclaimed and recognized anime of 2013. This anime is so pleasurable to watch, and there are so many episodes with cliff hangers, and it made me go "OH F**K WHY!?? ", and I somewhat impatiently waited for the next episode to be released. The story is amazing in my opinion, and one that truly deserves a 2nd season. And I know I sound like a massive Fan-boy, of SnK, which I probably don't mind being called, but it's been awhile since I've watched something like this. The art is smooth, detailed, beautiful, it really does show the horrified and distressed looks on the characters faces. The backgrounds are pretty too, and nothing ever seems out of place. Sound is also really good, the voice actors did great jobs on voicing their characters and I think, really portrayed who their character was meant to be as. And both Opening Theme songs were really good to listen to, one of the best I've heard in any anime in a while. Characters were done really nicely, however whilst some may agree that the money did seem 'overly-serious', I think it was perfect. I'm going to leave it at that, so that anyone who has not seen the anime, can see the characters for themselves. I really enjoyed this anime, and I know there are thousands of others that can agree that this anime has been one pleasurable, spine-chilling adventure, that will go down as one of the hottest anime series ever. Attack on Titan is one of those shows that shakes the anime industry once every decade. In the 80's, Mobile Suit Gundam catapulted anime in Japan. In the 90s, Dragon Ball Z broke the mainstream walls while Neon Genesis Evangelion opened the doors to the now indispensable late-night anime slots in Japan. In the 2000s, Fullmetal Alchemist marked the peak of manga-to-anime adaptations while Code Geass & Death Note headed the class of those who introduced the new anti-hero genre. And now, in 2013, Attack on Titan has shaken the industry once again. Unless you've been living under a rock for the past 5 months, you should at least know what the story is about, and for the sake of staying spoiler free, I'm not going into details on the plot. Before I wrote this review, I wrote a different piece moments after watching the first episode stating that Attack on Titan had all the potential to become a landmark anime, knowing very little of how true that statement would turn out to be. I have watched anime ever since I can remember. I have seen the very best and the worst that this industry has to offer. And I, like most of you, am very familiar with the relationship of manga-anime adaptation, which is the case of Attack on Titan. It is because of such experience and knowledge that I am able to say with so much confidence that Attack on Titan is the best anime series ever produced from any standpoint, at least, in the last decade. Attack on Titan is such a well-done product that it has all the key strong points we all dream every series could have. By this I mean the story, characters, animation, OST, opening/ending sequences, art, directing, narrative, character development, and, most importantly, the "it" factor. These are all present with "A grade" production values. First of all, I want to start with the OST. Simply put, Attack on Titan's soundtrack rivals that of Rurouni Kenshin and Evangelion. Period. Don't misunderstand, they are not similar by any means, they are simply equally as masterful. Check on the internet the impressions left by fans about the first soundtrack. And if you still don't believe me, tweet Hideo Kojima (creator of Metal Gear series) and ask his take on it. The OST is extremely important in this show because it allows you to feel the many epic moments that dwell in this 25 episode marvel. This is where the directing and narrative play a big role. For those of you who have seen Death Note (same director), you will feel an extra feeling of similarity with Attack on Titan, as the show relies heavily on its intense emotional scenes which you most certainly will feel the first 2 minutes of episode #1. It is in these scenes where the golden cast of characters shine. I cannot stress enough how unique the characters are. You could say they are the cream of the many accolades that Attack on Titan has. I'm still amazed by the quality of voice actors that just seem to just pop out in this show. The voices of so many main characters from hit series come together in Attack on Titan to help provide that epic feeling you start to get once episode #1 ends. Note I emphasize the voice acting because it's part of the anime but, obviously, not of the manga. Another key strong point is the work and effort put on the OP/ED sequences. If you've come this far in my review then you most likely understand when I say that Openings and Ending sequences are crucial. They provide that extra excitement to the show. It's definitely something not all anime series take seriously. Fortunately, Wit Studio took them seriously, and then came "Guren no Yumiya". The second opening, "Jiyuu no Tsubasa" is outstanding and marvelous in its own way and the second ending, "great escape", fuels that adrenaline rush of excitement you will get after those killing cliffhangers. Having said that, the first OP, "Guren no Yumiya", is simply epic. If there was ever something to describe as epic, it would be this OP. I am certain that as of today, it is the greatest anime opening ever. I'm amazed by the amount of attention it got on the internet and the hundreds of parodies derived from it. It was simply a treat to our eyes. The song. The animation in the opening. The sync between the two. Epic. You won't be skipping that opening. In addition, an animation production is never as close to perfection without the animation and art being top class. Now, Attack on Titan has astonishing art, to the point where you are amazed of how far animation has come. The scenes where there is sunlight will leave you speechless. The animation, unlike the other aspects, is where some disagree. The only thing I have to say is I was extremely impressed throughout the whole show until I saw a certain scene in episode #11 where the 3D maneuver gear was used, and I was stunned. I was simply stunned. Then, of course, later episodes also take it to a whole new level, but you're probably gonna be used to that quality of greatness by then. That's how ridiculously good Attack on Titan is. Now, like the characters, the story is mostly work of the manga's author. This includes character development, which I believe is the key to the success and extreme popularity of the characters. Also, the story maybe the most original aspect of this series. Nothing you have seen before is in this show. Nothing. Much like EVA, Attack on Titan gives you a world of "dystopia", on-edge, and uncertainty, so full of potential that just when you think you have it figured it out, it turns around and leaves you speechless. Oh, that will happen to you for the first time in episode #5. Guaranteed. Finally, even IF all these characteristics of an anime series are top notch, it won't amount to its potential if it doesn't have that "IT" factor. Some series have the "IT" factor without having all of these production values. They tend have 3 or 4 at most. Those become popular because they give out that feeling of "amazing". Gintama, the greatest gag series ever, comes to mind. Its anime doesn't have overwhelming OST, or eye popping animation; it does have A class characters and A class story (among others), but that "IT" factor takes it to another level. Now, imagine having practically everything an anime series has to offer in A class value while also having that "IT" factor. Extremely rare. Eva rare. FMA rare. Attack on Titan is part of that elite group. This is why its popularity rose to highs only few series reach. This is the first time I have ever written a detailed review of an anime series. I did it because this one deserves it. It's The anime series of my adult era. I can now relate to those anime fans who watched Evangelion almost 20 years ago. They knew they had something special, just like we do now with Attack on Titan. In conclusion, Attack on Titan is, of course, like MS Gundam, DBZ, EVA, FMA, Geass, and Death Note, not perfect. Like any other piece of greatness it does have its negatives. Having said that, when you add up the good and the bad, you end up with a landmark anime series that is currently shaking the industry with its mesmerizing, sensational, emotional, intense, and inspiring first season. Just imagine the wait and the hype for season 2. In the meantime, this is simply the best anime series in the last 15 years. Enjoy. 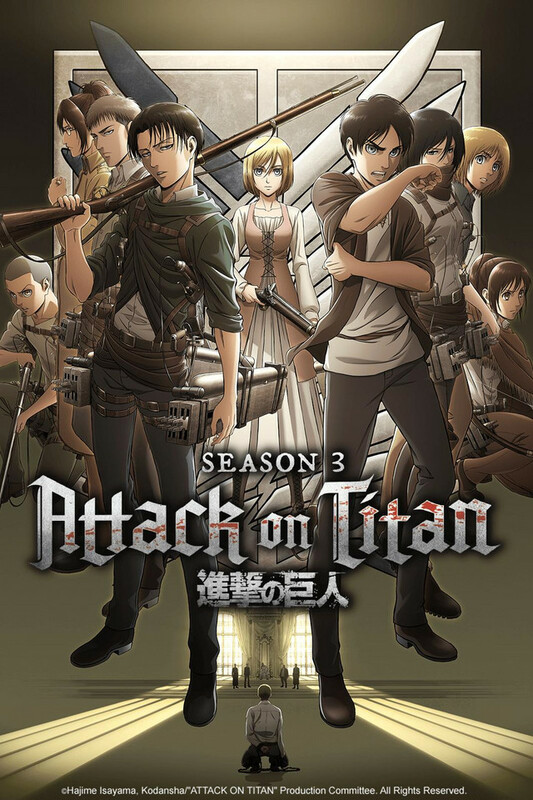 Shingeki no Kyojin, or some might call it Attack on titan brings us an outstanding story line that is original and very engaging, that compels the viewer to keep on watching every week, and sitting with your jaw hanging for a while after the massive cliffhanger at almost every episode, having the thought of waiting an entire week before we get to know more, and what else is there to do besides rewatching the anime while waiting for the next episode? ^^ (no life) well moving on. Since I have rewatched this anime probably more then 6 times so far I believe I have the right to say the art and animation of the anime was probably one of the best I have ever seen. The incredibly smooth and spirited action scenes were very well made, not to mention the music which fit the animations almost perfectly and made it seem even more intense and absolutely stunning. Although there were many plotholes that I expect all to be covered in the next season, well that is if there is one, the anime itself was extraordinary and very well made I highly enjoyed this anime and it definitely has reached my top 10, I also find it very amazing how an anime with only 25 episode is up to par with all the other mainstream and ultimately popular anime like naruto. Simply just amazing must watch for any anime watcher. Almost everything about this show is top notch level. Music is great, animation is great, plot is great, entertainment level is high, characters could do with a bit more development but still great. The Anime that made me create a Premium Membership Account. The title says it all. I just couldn't wait to watch the newest episode for free in a week, so I made a premium account. I know I can still watch it for free on other streaming sites, but when I saw that the money from premium members go to support anime creators as well, I made an account without hesitation. Anime like this deserves recognition. The anime for people who hate anime. As someone who has been watching anime for decades, I've seen a lot. There is one series in particular which I have regarded as the undisputed greatest anime of all time for the past 15 years. Only now, does a contender emerge. Attack on Titan has it all. If an interesting plot filled with highs and lows and laughs and tears isn't enough for you, then combine that with superior animation, direction, and a soundtrack that amplifies whatever emotion you happen to be feeling at the time. I have a lot of series that I watch which I wouldn't recommend to people. They're just filled with all the anime tropes which turn off people who aren't accustomed to that kind of thing. Fruity hair. Ridiculous,unrealistic personalities. And often times these are the things that people think of at the mere mention of the word "anime"
I have made it my personal mission in life, to make all the anime haters I know to watch at least the first 5 episodes of Attack on Titan. And each and every hater who has seen it, has been calling, texting, messaging me on facebook, desperate to watch episode 6. The bottom line here is, this series is amazing. And I recommend it to anyone and everyone. Except small children. It would probably induce some nightmares. The best thing since... Uh, has there ever been anything this good? The answer to that question is... no. There has never been anything this good. There are other shows that I love to the very core of my soul, but Attack on Titan is currently my favorite anime and I've never seen another show that was able to match it. People have cited all kinds of issues with it, from inconsistent animation, to a rushed story, and I accept that, but for me the animation was exceptional when it needed to be and the story didn't feel rushed to me at all. It was fast-paced sure, but never once did I think it needed more time on something. The fast pace of it is actually one of my favorite things about it. This show is just awesome all around. Fast-paced, brutal, satisfying action, suspense, a masterful story, great characters. This show has everything that I want in an anime(except for an ending). I strongly urge everyone to go watch it now and then proceed to buy as much merchandise for it as possible. We need a conclusion season. And we need it to be as awesome as the first. I've seen a bunch of good anime. But this one is completely different from anything I have ever seen before. It has just about everything you could want from an anime. I have just been blown away week after week and I love every episode they come out with. If you haven't seen this yet, go ahead and watch it.